Epiphany (or Twelfth Night) is the day on which the three kings (Les Rois Mages) came to Bethlehem to visit the baby Jesus, born to Mary and Joseph two weeks earlier. Historically, Christians in France celebrate the holiday by sharing a Galette des Rois, a flaky, buttery pastry filled with frangipane and a touch of rum. Some families celebrate on the actual holiday — which, this year, falls on Thursday, January 6th — and some celebrate on whatever Sunday falls between the 2nd and the 8th. Generally, it’s considered normal to celebrate Epiphany at any point during the month of January. No matter when you celebrate Epiphany, the eating of the Galette is always a highlight, as one lucky person will receive the slice that has a hidden secret called a fève. The fève is usually a small plastic or porcelain trinket in the shape of a king or a baby that has been tucked into the cake before it is sliced. 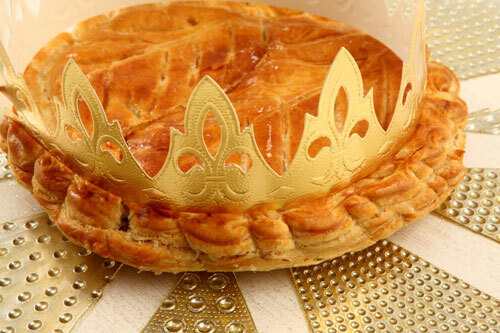 If you are the lucky recipient of the fève, you become King For a Day, and the golden paper crown that comes with the galette is bestowed upon you!